Winter season is flooded with lots of green veggies. Radish leaves are available in plenty during this time which are rich in Vitamin C that boosts our immune system. It also helps in reducing fatigue, swelling and inflammation. Stir fry, dal and pakoras are a few dishes which can be prepared with these leaves and I recently shared the pakora recipe. Mix all the ingredients well. Add warm water and make a soft dough. Keep covered for 10 minutes. Divide the dough into 8 to 10 equal sized balls and roll them into 1/2″ thick discs. Heat a tawa and cook both the sides of the rolled out rotis with oil. 1. Jowar flour can also be used instead of bajra flour. Amazing Paratha Vijaya. 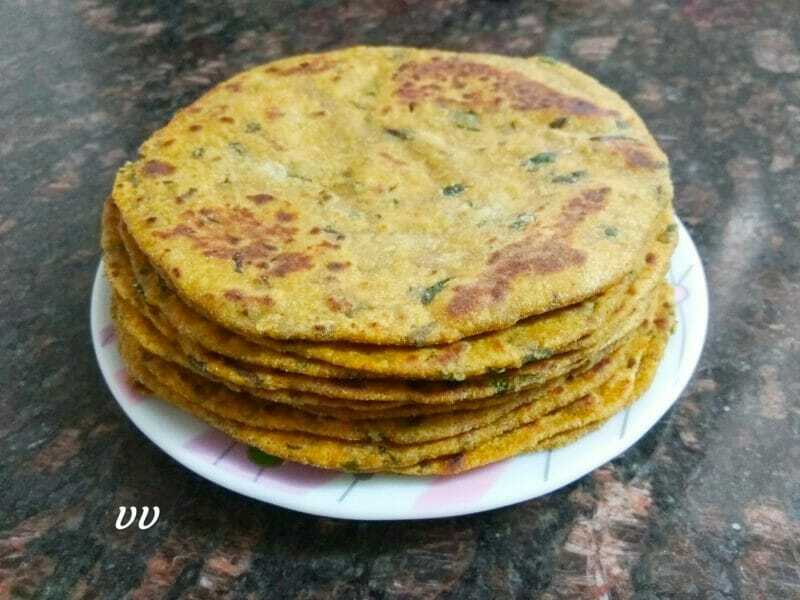 Made with mix of jowar and bajra and my family loved it. This is going to be a menu often in my kitchen now. Thanks a ton for sharing. Happy to get a validation from you! These parathas are low in carbs and best suited for diabetes.